Strong bicameralism, a large number of parties and changing majorities are commonly referred to as characteristics of the Swiss Parliament. More controversial is the question whether the Parliament has to be considered strong or weak. On the one hand, the Parliament elects the seven members of the Swiss government and among them – as a “primus inter pares” and for a one-year term only – the president of the country; on the other hand it has no possibilities to dismiss the government during the four years of the legislature. And more generally, to what extent does federalism, power sharing among parties, and direct democracy, (the three fundamental pillars of the Swiss political system), limit the power of the parliament? And what is the influence of parties and their elected members? In 1848, when Switzerland turned from a confederation of 25 rather independent cantons to a federal nation state, only limited power was given to the national government. Accordingly the scope of the national parliament was very limited. Ever since, the cantons – which maintained the residual power – have to accept any transfer of competence to the national level. Their strong position considerably slowed down the growth of the nation state and contained the latitude of its Parliament. The cantons, even nowadays, hold the most important share of public spending. New legislation is hardly passed on to the Parliament without prior consultation of the cantons and when it comes to executing national policies considerable leeway has to be left to them. Federalism also weakens the national Parliament in another respect. Since the constituencies for both houses are the cantons, the representatives in the Parliament have theoretically a double role. On the one hand, they are representatives of their parties and on the other hand, they are representatives of their cantons. In the National Council political debates take place along party lines, whereas in the Council of States (the federalist chamber) the Members of Parliament are supposed to defend the interests of the cantons against federal interests. This is, at least, what the cantonal authorities expect them to do. In recent times, however, party politics have also become more prevalent in the Council of States to the detriment of cantonal interests. As for the parties, it is not always easy to keep all their representatives on track. Since there can be quite important differences between the cantonal sections of one and the same party and the representatives knowing that they need the support of the voters in their canton to get elected, the parliamentary groups as well as the party leaders find it not always very easy to consolidate their positions and to bring forward their claims without deviant voices in their ranks. The most striking characteristic of the Swiss political system, direct democracy, also limits the power of the Parliament. In the Constitution it reads “Subject to the rights of the People and the Cantons, the Federal Assembly is the supreme authority of the Confederation” (Art. 148 BV). For the Swiss case this means much more than elections. The Parliament does not have a final say on constitutional amendments neither does it for legislative matters. Every change of the Constitution needs a popular vote and a majority of the citizens and the cantons accepting it. New laws or changes of laws can be challenged by a referendum and the collection of 50,000 signatures which also leads to a popular vote needing a majority of the citizens. And by collecting 100, 000 signatures an initiative can ask for an amendment of the Constitution which again leads to a popular vote needing a double majority to get accepted. As for law making or politics in general, administration, government and Parliament always have to bear direct democracy and the citizens in their minds. Prior to the debate in Parliament, proposals for a new law are not only presented to the cantons but also to the parties and any important interest group concerned in order to get to know their positions. If the project risks strong opposition and is likely to be challenged and turned down by a referendum, the government usually tries to meet these critics by adapting the proposal and making it “referendum proof”. This increases the number of actors involved in law making and lowers the influence of the Parliament. On the other hand, parties and parliamentary groups also have the possibility to play the game of direct democracy. The can become active more independently and find additional occasions to present their ideas and projects directly to the citizens. 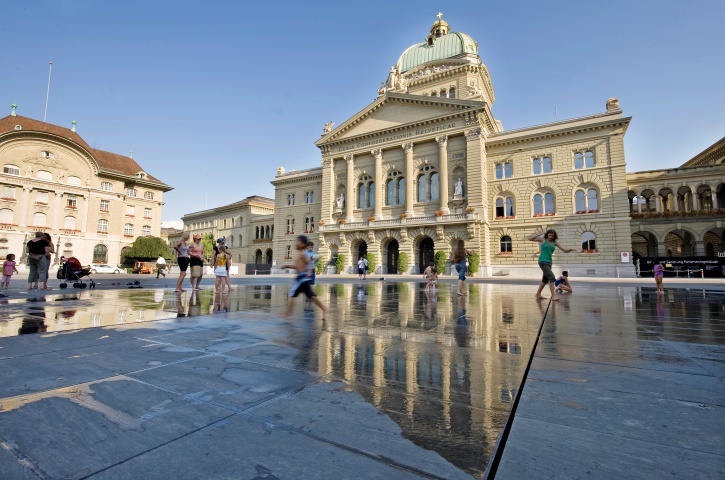 The third characteristic element of the Swiss political system influencing role and functioning of the Parliament is consensus democracy or power sharing among parties when it comes to the composition of the government. The government unites members of the most important parties without a formal coalition contract. This is so-called “Konkordanz” – is hardly questioned as a general principle and it is seen as a cornerstone of Switzerland’s political stability and success. Having no assigned or contractual majority in Parliament and government, coalitions between parties can vary without consequences. The challenge of Swiss politics is building up majorities on specific issues: most commonly the left, the Social Democrats and the Greens, stand against the three big center and right wing parties, quite often also the Swiss People’s Party on the right against all other parties. These patterns are followed in terms of frequency by all parties standing together, and a confrontation between center-left (Social Democrats and Christian Democrats) and mid-center-right (Liberal-Radical Party and Swiss People’s Party). Changing issue specific coalitions in Swiss politics are not seen as a problem, on the contrary. They are considered as the proof that policy making based on negotiating and compromising takes place. In order to pass a project through Parliament, it has to be supported by a majority of the members in the two houses. The lack of a governing majority combined with the necessity to set up viable issue specific coalition makes it difficult to pass legislation quickly and to pursue more demanding and coherent political programs. In this respect it also weakens the Parliament. The Members of Parliament, on the other side, enjoy considerable freedom, and they have the possibility to play important roles in policy making. They are not locked into a coalition contract and are therefore rather independent. They can hold deviant positions within their own parliamentary groups and do not have to support the government in order to prevent dissolution of the government or new elections of the parliament. This independence is also reflected in a high presence of MPs in the media, be it because they have a specific function in one of the committees, in the parliamentary groups or in the party, be it because the hold deviant positions or be it because they are representatives from a specific canton. The most influential Members of Parliament are those which are able to work across party lines and to build majorities by gaining support from members of other parties. Such majorities are badly needed to come to decisions. These politicians are also likely to be proposed as candidates for the Federal Council in case of a vacancy. In a nutshell: The Swiss Parliament might be considered a weak parliament due to the specific characteristics of the political system which limit its scope, its decisional competences, and its leadership capacities. It is, however, comparatively close to the citizens and its members can be rather powerful. Within committees and within the parliamentary groups the Members of Parliament have a considerable influence on political decisions and public policies.